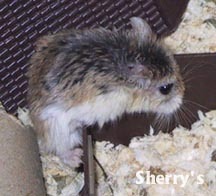 Should I get a roborovski? 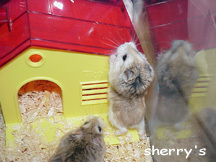 Roborovskis are fast moving hamsters that are better for observation than handling. They are more suitable for the older child or the adult. Young children may find them too quick and difficult to handle. Robos are usually very timid and like to hide in their houses. They are very fun and interesting to observe in play. They also have cute, round faces that look adoringly comical at times. Robos sleep in the day, though they are easily roused. 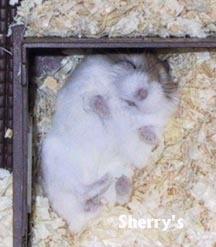 Any movement or noise will usually wake them up. And, once they are up, they are immediately active, unlike syrians, which usually need some time to "get up and go". Robos groom themselves often and don't require grooming from their owners. 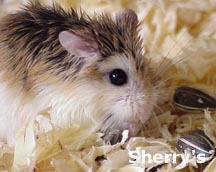 Some owners give them a dust bath like one would a chinchilla. 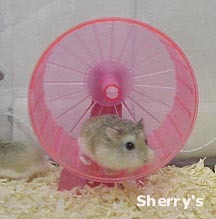 Robos love to run on the wheel and they can do so very fast. If they aren't provided with one, they may become quite restless. Many times, every robo in the cage will try to get onto the wheel at the same time and it starts to look like a sort of game for them. Robos don't eat very much. 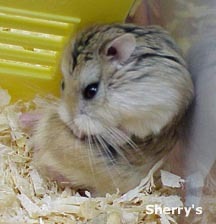 They store food in their cheek pouches just like the other hamsters. Don't get a roborovksi if the people playing with it are to be young children. They easily jump out of small hands and run away to hide in corners very fast. See also the section: Which species should I get? aggressive - do they fight or bite?